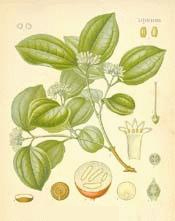 You are at:Home»Herbs»Strychnos Nux-vomica Linn. Latin name : Strychnos Nux-vomica Linn. Description : The seeds are properly detoxified in milk before use. It is antiinflammatory, astringent, aphrodisiac, bitter, blood purifier, nervine, resolvent, stimulant, stomachic, tonic, and spinal stimulant and also respiratory and cardiac stimulant. It is used as a febrifuge and its preparations are prescribed for nervous disorders. Also employed in atonic dyspepsia, for increasing appetite and in chronic constipation due to atony of the bowel. Strychnine, the chief alkaloid constituent of the seeds, also acts as a bitter, increasing the flow of gastric juice; it is rapidly absorbed as it reaches the intestines, after which it exerts its characteristic effects upon the central nervous system, the movements of respiration are deepened and quickened and the heart slowed through excitation of the vagal centre. The senses of smell, touch, hearing and vision are rendered more acute, it improves the pulse and raises blood pressure and is of great value as a tonic to the circulatory system in cardiac failure. It also cures pain in the joints, lumbago and is useful in paralysis, general debility, chronic rheumatism, gout and weakness of the limbs. Recommended Dosage : 60 to 250 mg. powder of properly detoxified seeds.